The Seven Sequels adventures continue with this book that follows Ink Me. 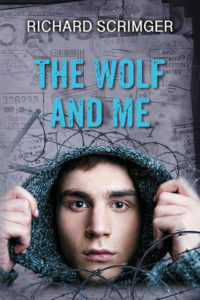 The Wolf and Me is about a boy named Bunny who is kidnapped by a secret organization (SPCA) during Christmas break when Bunny is visiting his family. Bunny is taken to the United States where he realizes he will have to escape back home to Canada if he wants to see his family again. Bunny makes a lot of new friends on his adventure back to Canada, including a wolf that helps him along the way. My favourite character in the story was the wolf because Bunny believed that the wolf was his grandfather who had died a few years back. The wolf helps Bunny escape the SPCA and return to Canada. Richard Scrimger writes this book in the words of Bunny, who has a lot of trouble with spelling and writing. His way of writing makes it very easy to identify with him and really connect well to the story. I would recommend this book to readers who like adventure stories as well as anyone who has been reading The Seven Sequels series. Review by Connor, age 12, grade 8.